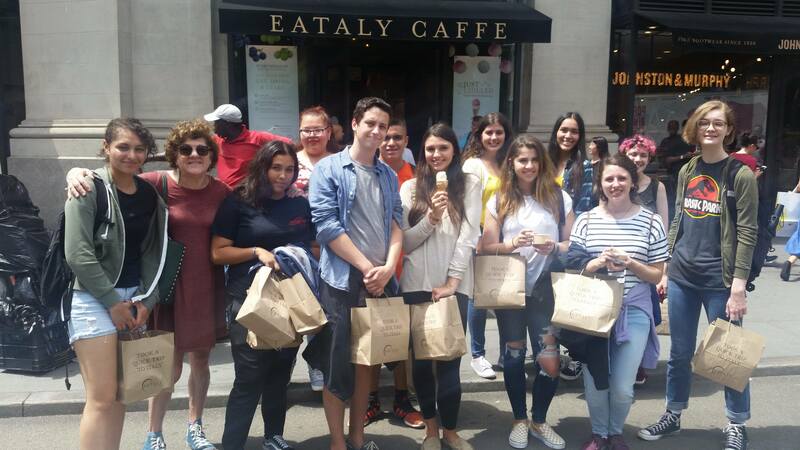 NJEA member and program coordinator Patti Grunther poses with students outside Eataly, an Italian-themed food hall in New York City. Patti Grunther had a problem. She had motivated and talented students in her Italian language classes at Watchung Hills Regional High School, but without Italian programs at the middle school sending districts, there was no way even for talented students to qualify for an Italian Advanced Placement class. Five years of the language is usually a prerequisite. “I asked myself, ‘What if kids could get an intensive course in the summer to fill the gap, providing them with the instruction and practice they would need to do well in an AP class?’” Grunther said. 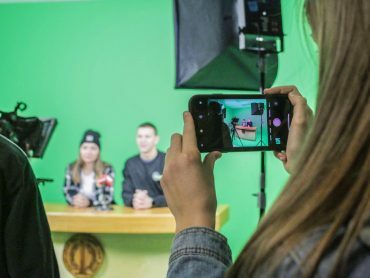 Luck would have it that at about the same time, Italian professors Teresa Fiore and Marisa Trubiano at Montclair State University (MSU) were looking for a way to connect with high school students studying Italian in order to encourage them to continue their studies at the college level. Grunther had met Fiore and Trubiano through Italian cultural evenings that Fiore organized as the Inserra Chair of Italian and Italian-American Studies at MSU (montclair.edu/inserra-chair). When the three discovered that they shared some of the same goals, they went to work to find a solution that could satisfy all their needs. They reached out to Italian teachers in other districts. Working with both public and private school teachers and administrators, they developed a consortium of schools in the tri-state area whose students would benefit from participating in an intensive Italian program during the summer. Currently, the consortium includes Clifton Public Schools, Palisades Park Jr./Sr. High School, Pascack Valley High School in Hillsdale, West Orange High School, Montclair High School, and Saint Peter’s Prep in Jersey City. Consortium schools help with promotion of the program to their students and others, but it is not necessary to attend a consortium school in order to apply to the program. Indeed, Elizabeth High School (also known as the Frank J. Ciccarell Academy) sent the highest number of participating students this past summer. Working with both public and private school teachers and administrators, they developed a consortium of schools in the tri-state area whose students would benefit from participating in an intensive Italian program during the summer. Another lucky stroke was that even though their course is unique and custom-designed, they were able to fit it into Montclair State’s existing Early College program, run in conjunction with the MSU Summer Session. This allows students to earn three college credits to be used if they one day attend MSU or at whatever other college accepts these credits. They were also able to count on the support of the Italian government through funding from the Italian American Council on Education, funds earmarked for high school projects. To be eligible for the course, students must have successfully completed Italian 3 Honors or the equivalent. Fees for the program are $750, a moderate price compared with average college costs. Moreover, thanks to the organizers’ fundraising efforts, many scholarships are available, including financial support from the New Jersey Italian Heritage Commission. The program runs for three weeks in the summer with students in the classroom from 9 a.m. to 12:30 p.m. with a native speaker of Italian, followed by a group lunch with Italian-speaking guests, lectures and conversation. Grunther works as coordinator of the program, including accompanying students on various field trips in the New York area; this summer, students visited an Italian modern art museum, toured designer showrooms, and learned how to make handmade pasta at Eataly, the Italian-themed food hall in New York City. Guest speakers have included journalists, college professors, art historians, local architects and entrepreneurs, all of whom serve to highlight the many areas that students can explore as Italian language students at college and eventually in their future careers. Students not only earn three college credits, they gain the confidence and knowledge necessary to do well on an AP Italian exam. They are also exposed to the profoundly Italian fabric of the New York metropolitan area, both in terms of the important historical presence of Italians and various thriving Italian business sectors. Grunther has seen an unexpected benefit. 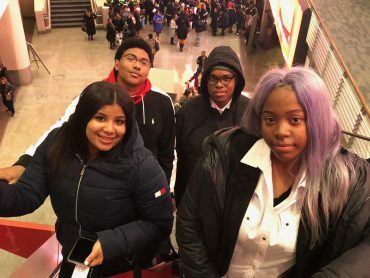 Montclair State first ran the program in 2017, and the response was overwhelmingly positive from students, parents and teachers in the participating districts. “In my district, every student who participated in the consortium got a 3 or higher on the AP exam with some students even scoring the highest grade of 5,” Grunther said. “And they did it with only four years of high school Italian, an amazing result that makes me incredibly proud of them!” she added. 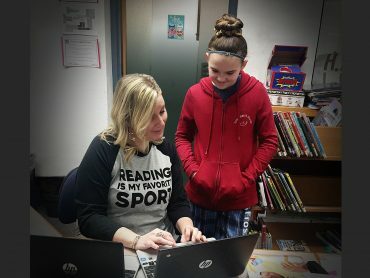 With 33 students over the past two years, Grunther is eager to spread the word about the program in the hopes that it might help other educators and students. Attend a campus panel and presentation about the program on November 15th. Additional information.